How can we gain more insight into the Bible? 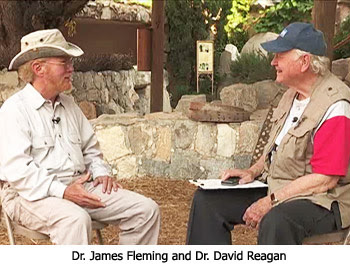 Dr. Reagan: We're going to start with Jim Fleming in the threshing floor of his garden here at the Explorations in Antiquity Center. Dr. Fleming: I'm glad you came back this time 2,000 years earlier to see me again. Dr. Reagan: Jim, this is I think the third time that I have visited one of your sites. The first time was on Bethlehem Road right in Jerusalem. Then you had a lot of trouble there from Palestinians who were coming in and causing damage, so you moved to Ein Kerem which is a suburb of Jerusalem. Now you're here to LaGrange, Georgia. Tell us a little bit about that process. Dr. Fleming: Our ministry in Jerusalem was important for Christian tourism, so we charged Christian tour groups. But, whenever we had a Jewish or Muslim group within the country like a school, synagogue, or even a mosque visit the museum, we always offered entry for free because we had then an educational moment for Christian witness to non-Christians. Once tourism began to collapse during the Second Uprising from 2000-2005, visitors almost completely disappeared. We were unable to pay our landlord, so we had to close our gates in 2005 at the Ein Kerem property. So, we came to the US wondering, "I wonder if we could build a museum here?" We asked around and we found a foundation in the town of LaGrange, Georgia. The Calloway Foundation said that if we would put the museum here they would give us matching grants dollar-for-dollar for any money that we raised. Now that's an offer you just can't refuse! We felt it was a gift from the Lord. 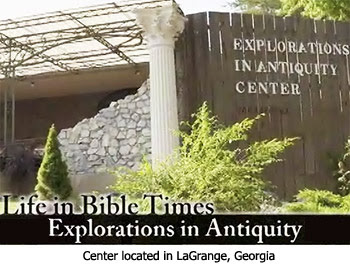 Dr. Reagan: I've visited all three of your sites and the Explorations in Antiquity Center is the most elaborate, most fantastic, really worthwhile place to bring a Christian group. Dr. Fleming: I'm glad you can made that evaluation, David, thanks. Dr. Reagan: Tell us a little bit about yourself and your background, Jim. Dr. Fleming: It's kind of weird story. I come from an airline family, so I spent most of my life overseas in Asia and Africa. My dad helped countries start their own airlines. I could fly for free, and so when it was time to do graduate studies I thought I should use these free flying privileges to study overseas. I was interested in Biblical Studies so I thought, "Why don't I study in Israel?" So, I studied on the Masters level in Jerusalem, Israel. Later I was privileged to be invited back to teach at the school where I had studied in Jerusalem. While in Jerusalem, I got more interested in tours pretty much to see the churches or ruins, even though most people have a hard time picturing how a site really looked before it was a ruin. I thought, "If we could have a place where we have reconstructions as to how things originally looked, such as a functioning threshing floor with functional threshing equipment for example, it would really help the Bible come to life for daily life." That idea birthed how I made all of my museums, trying to be in a real setting. We had to actually recreate terrace agriculture and the corresponding implements. But, the idea is to help people climb out of their 20th Century skin and don sandals and go back to biblical times. Dr. Reagan: When you went to Israel you gave the impression that you went over there to study and that was it, but Israel actually became your home. You lived there for over 30 years, didn't you? Dr. Fleming: Yes, that's right. For 36 years Israel was my home. In fact, I thought I would probably retire there until we had to close down the museum. Dr. Reagan: Then an accident happened to you that made you world famous among archaeologists. Dr. Fleming: You always bring up something that took no foresight nor brilliance. It is called "stumbling into an archaeological discovery." I fell into a hole. I was photographing around the Old City of Jerusalem and I was taking a picture of the Eastern Gate to the city. It had been raining for several days and so of course the ground became soft. There was a mass burial tomb under where I was standing. Just when I went "click" taking a picture of the top of the gate, I fell down eight feet into the ground. I found myself in a mass tomb surrounded by 46 skeletons. Actually, I didn't count them right away. I wanted first to make sure enough rocks fell in so that I could climb up and it wouldn't be 47 skeletons! Dr. Reagan: Brother, if I'd fallen down in that tomb I would have walked on air to get out, and here you're counting skeletons! You actually took a camera and started taking pictures, and what did you see in one of those pictures? 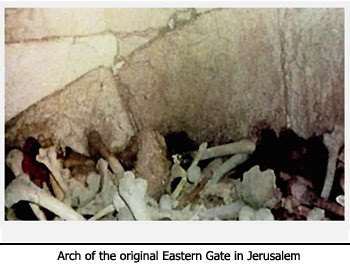 Dr. Fleming: I saw an arch of an earlier gate. Dr. Reagan: So, you proved that the ancient Eastern Gate was located below the current Eastern Gate, which was a major archaeological debate up to that point? Dr. Fleming: Yes, that it was finally fully discovered. The top of the arch is in place, which means another 20 feet down or so would be the roadway. I told my archaeologist professor the next day and he thought I fell on my head. "Sure you found the gate," he patronized, but at least he was willing to come back to the site. Can you believe the Islamic authorities had already cemented the hole over? That's very uncharacteristic of Middle East efficiency back in 1969. At that time I was just a kid. Dr. Reagan: You may have been just a kid, but you become world famous overnight among archaeologists. That was amazing. Dr. Fleming: No, no. I think the Lord had a purpose for my life. I do feel that, as we all should. Dr. Reagan: Let's talk about purpose for a moment. You've touched on it, but I want you to get very specific. What is the purpose of the Explorations in Antiquity Center? Dr. Fleming: The Center exists to help people see daily life as the ancients would have seen it. People would then learn to think in the way the ancient people thought, which will help the Bible come alive for them. We read the Bible from a modern way of thinking. So, how can we suspend some of that? The answer is to look at the very practical daily life and imagery from biblical times. Dr. Reagan: You have many sites out at the Center in what you call your Biblical Garden which is where we're going to be taking a look at. You also have an educational center were you have an auditorium with maps and all kinds of multi-media presentations and programs you can present, correct? Dr. Fleming: Yes, we try to run conferences. We have some areas particularly geared to clergy. Most of what we do though is for the layperson who is interested in the life of the Church. 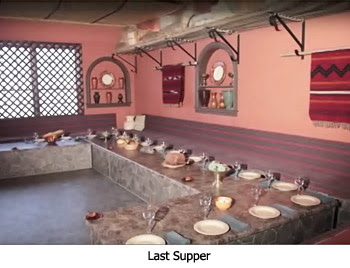 Dr. Reagan: Also inside your main building you have some places where you can have a biblical meal and see what the Last Supper really looked like. Dr. Fleming: Right. There have been so many archaeological discoveries that give a completely different idea than church art historically has. Dr. Reagan: Could you give me an example off the top of your head why how better understanding the culture of the First Century would better help people understand something that's said in the Bible? Dr. Fleming: Only a thousand come to mind! Okay, did you know houses in the time of Jesus were 20 to 40 rooms holding 50 to 75 people over three to four generations, all living in one house? All relatives by marriage lived in one house. That little fact helps you reinterpret parables. Why does the woman when she has lost one out of ten coins tell her friends and neighbors? It's because they're looking for it as well. They all live together and share cooking rooms, courtyards and storage rooms. You see, the story is in the context of a collective identity. Part of such a system can be rough because everybody knows everything about everybody and talks about them all of the time, but the good part of living in such a way is that you have a great support system. Dr. Reagan: Living among so many family members is sort of your social security system? Dr. Fleming: Yes, there was no need for care institutions for the elderly. So, collective living gives you a new nuance in understanding these stories. We can then understand that life then meant there was little private matters like we think in the United States where it is such an individualistic country. When the prodigal son wished his mom and dad were dead and asked for his inheritance in advance, well everybody knew about it. It's not just the one family that knows, but all of the relatives, even relatives who are not even there. The son had embarrassed that neighborhood and even the whole town. Dr. Reagan: So, in a town like Nazareth which was tiny with maybe 200 people, everybody knew everybody and everything about everybody? Dr. Fleming: Yes, because they did all things together. One thing that is really interesting about the story of when Mary and Joseph left Jesus behind in Jerusalem, that "home alone" story, the next day or that night probably as they were counting noses they realized Jesus wasn't with them. They inquired amongst their relatives and friends if anyone had seen Jesus? That meant Mary and Joseph and Jesus had a support system of family and friends who came with them for the coming of age visit of Mary and Joseph's son to Jerusalem. That means Mary and Jesus would not have been alone either with the eventual loss of Joseph, which is apparently so from his absence in the Bible in Jesus' later life. Dr. Reagan: I would suppose it means too that when Mary became pregnant everybody in town knew about it? Dr. Fleming: That's the down side, yes. Dr. Reagan: It probably would have been good for Joseph to take Mary with him to Bethlehem as he had to go because of the Census then. That way no one would have known exactly when the baby was born or the circumstances. In the second part of this series with archaeologist Dr. James Fleming at his Explorations in Antiquity Center, we'll glean some biblical insights by learning what life in the First Century was like when living in a Bedouin tent.